There are many studies describing prediction equations for the measurement of single breath carbon monoxide diffusing capacity of the lung (Tlco).1–6 These studies have demonstrated that the main predictors of Tlco are height, gender and age. Significant limitations of the previous studies include small sample sizes,3 7 non-standardised equipment1 3 5 and different concentrations of inspired oxygen.1 3–7 Importantly, previous prediction equations have been based on populations that included only relatively few subjects older than 55 years. However, in clinical practice, Tlco is most likely to be measured in this age group as many respiratory diseases such as chronic obstructive pulmonary disease (COPD) are predominantly confined to older patients. Despite evidence of increasing morbidity in older people with respiratory disease, knowledge of normal respiratory function in this population is limited. Diffusing capacity along with spirometry is the cornerstone of the clinical guidelines for the diagnoses of COPD and other pulmonary conditions.8 9 Current measurements are compared with “normal” values which have been calculated using algorithms derived from population studies of healthy volunteers. Only relatively recently have publications reported normal values for spirometry in those aged over 70 years in European10 and American11 populations, which show departures of 20% or more obtained in predictive values compared with those obtained from extrapolations of equations derived in younger people. Neither of these studies included Tlco measurements. Finally, the population sampled has a significant effect on the outcomes of the study. In a recent study,1 weight was shown to be a significant predictor of Tlco and Tlco/alveolar volume (Va) (Kco) in the female population. However, in this Spanish study, the distribution of weight was limited, again making the equations susceptible to extrapolation errors in broader clinical populations. Tlco and Va were obtained in caucasian subjects with no history of lung disease based on questionnaires, who either never smoked or were former smokers. Lung function was not used to define normality as it can become a circular argument when creating new prediction equations for “normal” subjects. The subjects were recruited as part of another larger epidemiological study of COPD.16 All patients had Tlco and spirometry measured, and were administered the European Community Respiratory Health Study (ECRHS) questionnaire17–19 (see online repository for further details). Smoking status was based on standard Australian smoking questions.20 Anyone with serum cotinine >100 μmol/l was reclassified as a current smoker and excluded from the analysis. We further excluded any subject who met Global Obstructive Lung Disease (GOLD)21 criteria for COPD stage 2 or greater. The study was approved by the ethics committee at The Alfred, Melbourne, Australia. All participants gave written informed consent. Single breath Tlco was measured in duplicate on a fully computerised system (Medgraphics Profiler, Minnesota, USA, software V.4a) according to ATS/ERS guidelines.9 This testing system uses gas chromatography for the measurement of gas concentrations and a pitot tube for measurement of flow. The inspired gas mixture contained 0.3% carbon monoxide, 0.5% neon, 20.6% oxygen, with the balance, nitrogen. Breathhold time was calculated as described by Jones–Meade,22 washout and sample volumes were set to 0.9 l and an interval between repeat tests was at least 4 min. At least two measurements were performed which had to agree to within 1 mmol/min/kPa or 10%, whichever was greater, otherwise further measurements were made until repeatable results were obtained. All Tlco results were corrected to a standard haemoglobin concentration of 14.6 g/dl using the method described by Cotes.13 Standing height (m) and body weight (kg) were measured without shoes. The quality control of the flow and volume signals was performed using a pulmonary waveform generator initially, an explosion decompression device monthly and biological control weekly. The flow sensor was also calibrated prior to each testing session using a 3 l certified syringe. The accuracy of the Tlco and Va measurements was determined monthly using a custom built validator. The Tlco and Va validator consisted of a 3 l certified syringe and two accurately known concentrations of inspired and expired CO and Ne to simulate typical inspired and expired gas concentrations. With the two gas mixtures it was possible to simulate a measured Tlco and Va value with known limits of agreement (7.20–7.43 mmol/min/kPa for Tlco and 3.15–3.25 l for Va). Tlco measurements were taken at ATPS and subject dead space correction was not included.23 Further detail of the methods is supplied in the online repository, including the results of the quality assurance programme for the testing equipment. All analyses were performed using SAS V.8.2 (SAS Institute, Cary, North Carolina, USA) or SPSS V.15.0 (SPSS, Chicago, Illinois, USA). Multivariate linear regression models were constructed using a stepwise selection technique and validated using a backwards elimination technique. Each model was then assessed for clinical and biological plausibility. A two sided p value of 0.05 was considered statistically significant. We recruited 1201 subjects into the study; 147 were excluded as current smokers, 41 had doctor diagnosed COPD and one was excluded for dwarfism. We then excluded a further four subjects with incomplete smoking data and 36 with undiagnosed COPD (GOLD stage 2 or greater), leaving a total of 972 subjects (498 male and 474 female). Table 1 shows the demographic details of the sample. All subjects were aged between 45 and 71 years with a relatively even distribution across the ages up to 70 years. Of the 498 males, 248 (50%) were ex-smokers, and of the 491 females, 159 (34%) were ex-smokers. The mean pack year history of the ex-smokers was 13 (range 5–28). Both linear and more complex higher order models and interactions between variables were explored. The model that gave the best fit was one in which height was cubed, age squared and included an interaction between age and being an ex-smoker (table 2). This model explained over one-third of the variance in Tlco. Predicted Va was a simpler linear equation which included the terms height and weight which described nearly half of the variance in Va. The model that gave the best fit for Tlco in the female population was one that included height, height cubed, age, weight and an age–height interaction (table 2). Similar to the equations for males, this model explained 36% of the variance. The equation for Va was also similar to the male equation including height and weight but it also included an age–height interaction term and explained one-third of the variance. In our sample, there was an interaction between age and height that was a significant predictor for all outcomes in females. The effect of an age–height interaction was a greater rate of decline in age related Tlco with increasing height. That is, the taller the subject the more rapid the decline in Tlco with age (see fig 1 in the online repository). This interaction is a novel finding which significantly increases the total explanatory power of the model. Figure 1 (A, B) Carbon monoxide diffusing capacity of the lung (Tlco) vs age for males (A) and females (B). Height for males was assumed to be the mean height in our sample (1.75 m for males and 1.62 m for females). Weight in the females was assumed to be the mean measured weight of the sample (70.4 kg). The Miller equations were those of the non-smoking group. Table 3 gives the mean predicted Tlco for other published prediction equations using our data set. In our sample, Tlco expressed as per cent predicted was systematically lower using all of the previous commonly used prediction equations. This is highly likely to reflect the older population included in our study. The previous prediction equations that best fitted our sample were those of Miller and colleagues.5 Conversely, the equations of Knudson and colleagues7 substantially overestimated the observed mean Tlco in both males and females. We have developed a new set of prediction equations for the measurement of Tlco and Va for a middle aged and older population using current computerised equipment and methods. We have shown that there are major differences in our equations compared with previous studies that were mainly developed in younger populations (table 3). The importance is that a significant proportion of patients seen in a clinical lung function laboratory are in this particular age group, making our new equations more clinically relevant. Many of the respiratory disorders that use Tlco to help diagnosis, such as parenchymal and pulmonary vascular lung diseases, occur predominantly in an older population. Previous equations1 3–5 7 have had relatively few subjects (eg, eight males3) in older age groups (>60 years) compared with younger (<40 years) age groups. Inclusion of relatively few older subjects has led to the equations being susceptible to error in this group. Moreover, extrapolating the equations to patients with an age greater than those included in a specific study can lead to considerable error, especially if the data are biased to a younger population. Previous studies looking at spirometric prediction equations in an older population have shown differences of up to 20% compared with extrapolating equations generated from a younger population.10 11 Mean age of the subjects in our study was substantially older than other recent studies of normal Tlco ranges, where the mean age has been as young as 35 years.1 Over half of the subjects in our sample were more than 55 years of age. A substantial minority of the subjects included in our study were classified as ex-smokers, which improves the generalisability of our prediction equations. Although most of these subjects had only a limited smoking history, separate analyses to develop separate prediction equations for Tlco based on the never smokers and ex-smokers were performed. While the regression curves were slightly different (fig 2 in the online repository), especially in the older subjects, this was not statistically significant. Nonetheless, being an ex-smoker was a significant predictor of Tlco in our male population. There may have been some under-reporting of previous smoking in this population, or there may have been some other confounding factor, such as passive smoking/occupational exposures, to explain the results. Furthermore, there was an interaction between age and being an ex-smoker. Ex-smoker status was only a significant predictor for Tlco in males and not females, who may have smoked less. This is the first study to describe a set of prediction equations for the measurement of Tlco and Va in a middle aged and older population. Moreover, we have shown a number of interactions between predictors that had significant effects on the outcome. Previous studies have mainly confined predictors to height and age.1 3–5 7 However, some other authors have used terms including weight.1 Previous studies have also tested for non-linear effects and also performed various transformations, which have added little to the strength of the models.1 5 We confirmed that the improvement in R2 using complex higher order terms was small compared with the use of simple linear equations. However, we believe it makes little difference to the end user as most equations are now incorporated within the software of the measuring device. The subjects studied were sampled randomly for another larger epidemiological study.17 There is much controversy in the literature regarding the inclusion of ex-smokers. Some studies have found statistically different measurements of Tlco in smokers versus non-smokers, but we did not find this in our group. Ex-smokers would be expected to have a lower Tlco than never smokers. As a high proportion of patients presenting to a pulmonary function laboratory are former smokers, the ability to adjust for this factor improves the likelihood of detecting pulmonary disease. 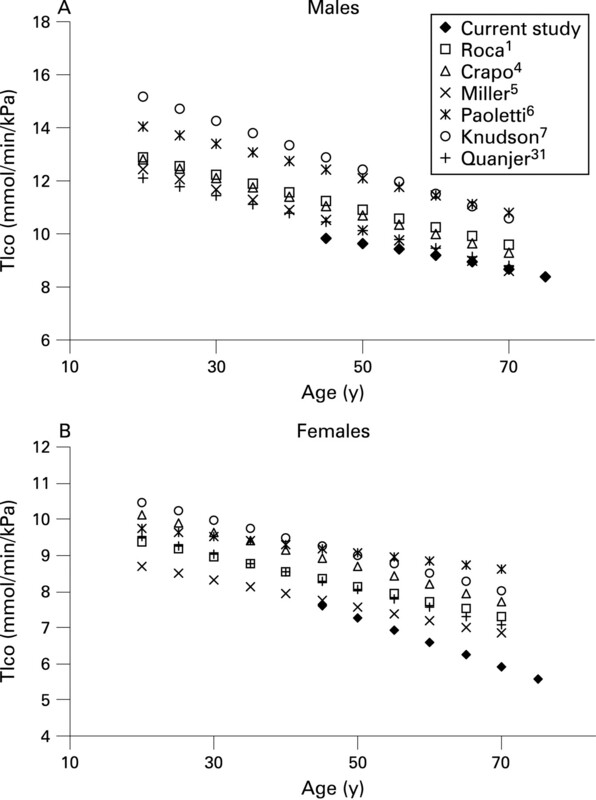 Weight was first demonstrated by Roca et al1 to be a significant predictor of Tlco in females. However, the weight term may falsely elevate the predicted Tlco, especially in overweight and obese subjects. Part of this is likely because of the narrow weight range that was included in the population studied (60–75 kg1). Therefore, previously published equations need to be extrapolated on a relatively frequent basis making the predicted value unreliable. This is especially the case with the documented increase in obesity in the population.26 Not including the weight term would lead to increased numbers of people with reduced Tlco relative to their predicted values solely based on their weight. Further analysis of BMI demonstrated that 1.9% of the subjects were classified as underweight (BMI <20 kg/m2), 29.2% were of ideal weight (BMI 20–25), 47.3% were classified as overweight (BMI 26–30) and 21.6% of subjects were classified as obese (BMI >30). There was a positive relationship between weight and Tlco. However, the maximum difference in mean Tlco between the groups was only 0.60 mmol/min/kPa. Furthermore, it was the overweight not the obese group that led to the significant weight term in the equation. The mean Tlco for the overweight group was 0.60 mmol/min/kPa higher than the ideal weight (p<0.001) whereas in the obese subjects the Tlco was only 0.35 higher than the ideal weight group. There are relatively few studies that have entirely complied with the ATS/ERS criteria9 for the measurement of Tlco. Importantly, existing studies have significant methodological differences in the measurement of Tlco relating to the calculation of breathhold time, Fio2 and deadspace correction. Moreover, there have not been any published prediction equations using fully computerised equipment. The type of analyser used for the CO analysis, type of insoluble inert marker gas used for the calculation of Va and estimating the initial alveolar CO concentration may all play a part in contributing to the variability of the measurement of Tlco. Our study is up to date, using modern equipment and methods. Calculation of breathhold time has also been shown to be important, leading to differences of up to 6.8% in measured Tlco27 between the method described by the Epidemiology Standardisation Project28 and Ogilvie and colleagues.29 Using the breathhold time calculation, as described by Jones and Meade,22 gives a similar measured Tlco to that of Ogilvie and colleagues.29 The ATS criteria stipulate the Jones–Meade calculation, which is what was used in the current study. The Medgraphics system uses gas chromatography for the analysis of tracer gases. Also peculiar to this system is the use of neon as the insoluble inert tracer gas. Neon has a relatively low diffusivity and therefore likely to distribute further throughout the lung, leading to a higher measured alveolar volume than helium.30 Even though the latest ATS/ERS9 document states that the tracer should have a diffusivity closer to that of helium, there are now large numbers of computerised devices that use different gases such as methane and helium. We have developed a set of prediction equations for an older population using modern computerised equipment. The equations generated gave a significantly higher predicted Tlco than most of those previously published.1 3 6 7 Most of the differences are likely to be explained by the older population, but methodological differences cannot be excluded. The latest ATS/ERS guidelines for the performance of Tlco state that prediction equations need to be selected carefully taking into account important methodological differences. This is one of the few studies using fully computerised equipment, gas chromatography for the gas analysis and neon as the tracer gas. Furthermore, we have developed a set of prediction equations more specific to an older population which are therefore likely to be the most clinically relevant available. Biljana Skoric and Melanie Matheson assisted with data collection and management.
. Single-breath carbon monoxide diffusing capacity prediction equations from a Mediterranean population. Am Rev Respir Dis 1990;141:1026–32.
. Standardized single breath normal values for carbon monoxide diffusing capapcity. Am Rev Respir Dis 1981;123:185–9.
. Single breath diffusing capacity in a representative sample of the population of Michigan, a large industrial state. Am Rev Respir Dis 1983;127:279–87.
. Reference equations for the single breath diffusing capacity. A cross-sectional analysis and effect of body size and age. Am Rev Respir Dis 1985;132:806–13.
. The single-breath carbon monoxide diffusing capacity. Reference equations derived from a healthy non-smoking population and effects of hematocrit. Am Rev Respir Dis 1987;135:805–11.
. The COPDX Plan: Australian and New Zealand Guidelines for the management of chronic obstructive pulmonary disease. Med J Aust 2003;178:S1–40.
. Standardisation of the single breath determination of carbon monoxide uptake in the lung. Eur Respir J 2005;26:720–35.
. Spirometric reference equations for European females and males aged 65–85 yrs. Eur Respir J 2004;24:397–405.
. Spirometric reference values for women and men 65 to 85 years of age. Am Rev Respir Dis 1993;147:125–33.
. Effect of O2, N2, and CO2 composition on the non-linearity of Fleisch pneumotach characteristics. J Appl Physiol Respir Environ Exercise Physiol 1984;56:1423–5.
. Effect of variability in gas analysis on the reproducibility of the pulmonary diffusing capacity by the single breath method. Thorax 1963;18:151–4.
. Lung function. Assessment and application in medicine. Oxford: Blackwell Scientific Publications, 1993.
. Accuracy of gas analysis in lung function laboratories. Thorax 1986;41:133–7.
. Respiratory symptoms and lung function in older people with asthma or COPD. Med J Aust 2005;183(Suppl 1):S23–5.
. Biological dust exposure in the workplace is a risk factor for chronic obstructive pulmonary disease. Thorax 2005;60:645–51. European Community Respiratory Health Study (ECRHS) questionnaire. http://www.ecrhs.org (accessed 22 July 2008).
. The natural history of chronic bronchitis and emphysema. Oxford: Oxford University Press, 1976. Australian Institute of Health and Welfare. National Health Data Dictionary, v.10. AIHW Catalogue No. HWI 30. Canberra: Australian Institute of Health and Welfare, 2001. National Institutes of Health, National Heart, Lung and Blood Institute. Global strategy for the diagnosis, management, and prevention of chronic obstructive pulmonary disease. NHLBI/WHO Workshop Report. Bethesda: NHLBI/WHO, 2001; publication No 2701.
. A theoretical and experimental analysis of anomalies in the estimation of pulmonary diffusing capacity by the single-breath method. Q J Exp Physiol 1961;46:131–43.
. Questionnaire based study of inter-laboratory variability of the single breath TLCO test: instrumentation, technique, calculation, quality control and predicted values. Volume 1985;5:4–13.
. Variability of the single-breath carbon monoxide transfer factor as a function of inspired oxygen pressure. Eur Respir J 1988;1:573–4.
. Standardized lung function testing. Bull Eur Physiopath Respir 1983;19:39–44.
. Overweight and obesity in Australia: the 1999–2000 Australian Diabetes, Obesity and Lifestyle Study (AusDiab). Med J Aust 2003;178:427–32.
. Diffusing capacity for carbon monoxide. The effects of different derivations of breathhold time and alveolar volume and of carbon monoxide back pressure on calculated results. Am Rev Respir Dis 1985;132:1127–9.
. Epidemiology standardisation project. Am Rev Respir Dis 1978;118(part 2):55–111.
. A standardized breath-holding technique for the clinical measurement of the diffusing capacity for carbon monoxide. J Clin Invest 1957;36:1–17.
. Convection-dependent and diffusion-dependent ventilation maldistribution in normal subjects. J Appl Physiol 1985;59:838–46. Funding: National Health and Medical Research Council grant. Ethics approval: The study was approved by the ethics committee at The Alfred, Melbourne, Australia.